Well-known British fashion designer, Marion Foale, has made her yarn available to hand knitters for the first time to coincide with the release of the first in her new series of books, Marion Foale Knitting Collection I. The soft, 100% wool yarn is machine -washable and available in 25 rich colors. 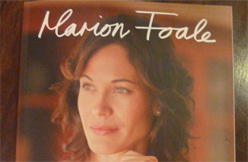 "Marion Foale DES R.C.A. is one of Britain's most respected fashion designers. Whilst a student at the Royal College of Art, Marion achieved the honor of having her design chosen for the Queen's Mantle worn for the anual Order of the British Empire's dedication ceremony. At the start of the Swinging Sixties and, on attaining their degrees in 1961, Marion and Sally Tuffin started their own business, Foale and Tuffin. For patterns to hand knit garments previously only sold in Barney's and Bergdorf's check out Marion Foale's Knitting Collection I.